One of the most renowned and best-loved illustrators of his day, English artist Arthur Rackham (1867-1939) brought countless stories and fairy tales to life through his vivid imagination and eye for telling details. Combining a sensitive use of line with subdued watercolors, he skillfully depicted forests of startling trees with claw-like roots, wholesome fairy maidens, monsters and demons, and backgrounds filled with obscure figures. His inspired illustrations for the fairy tales of the Brothers Grimm (1900) brought him his first great success, with a long and distinguished career to follow. 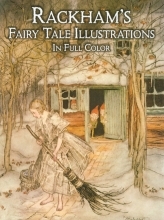 This collection of 55 full-color plates, reproduced from rare early editions, con-tains a rich selection of Rackham's best fairy tale images: a giant terrorizing the inhabitants of an isolated village in English Fairy Tales, a wicked witch greeting two lost children on her doorstep in Hansel and Grethel, a young maiden beset by snarling wolves in Irish Fairy Tales, and many more, including illustrations from Snowdrop and Other Tales, Little Brother and Little Sister, and The Allies' Fairy Buok. Fairy tale enthusiasts will be dazzled by this collection, as will Rackham devo-tees and lovers of fine art.